INDICATIONS: Stimulates acupressure points activates blood circulation, tiredness, freshness, effective in shoulder pain & total health. 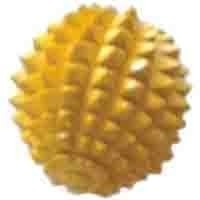 This is in pyramidal ball shape. hence it is known as energy-ball. Incepted in the year 2010, at Coimbatore, (Tamil Nadu, India), we “Acupressure Health Care Systems”, are a “Sole Proprietorship Firm”, and the foremost Manufacturer, Exporter and Supplier of superior quality Acupuncture Equipment, Acupressure Equipment, Magnetic Health Equipment, Sujok Equipment, Vastu Products, Naturopathy Equipment, Massager Equipment, Vacuum Cupping, Yoga Products, etc. Under the supervision of our Mentor “Bhagwan Singh Choudhary (Proprietor)”, we have accomplished the apex of success in this competitive market. We export our products all over the world.